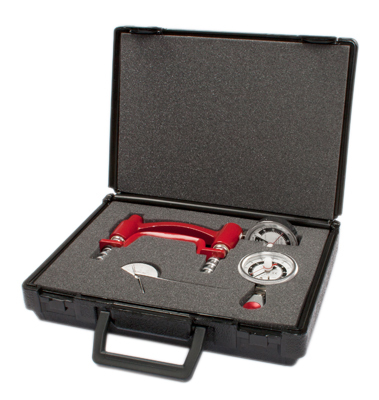 Baseline® 3-piece LiTE® hand evaluation set includes the following instruments stored in a protective carrying case: LiTE® 200 pound capacity hydraulic hand dynamometer (red), LiTE® 50 pound capacity hydraulic pinch gauge (red), and 6 inch stainless steel finger goniometer. 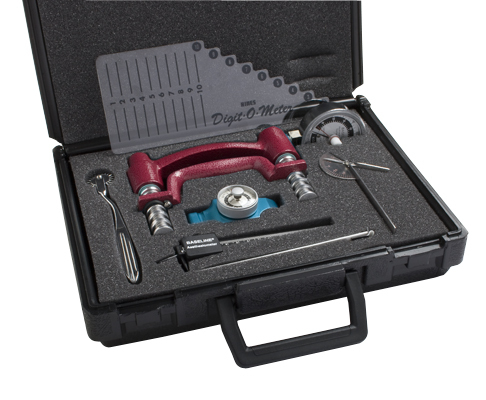 Dynamometer and pinch gauge have a 1 year manufacturer's warranty. CE Certified. 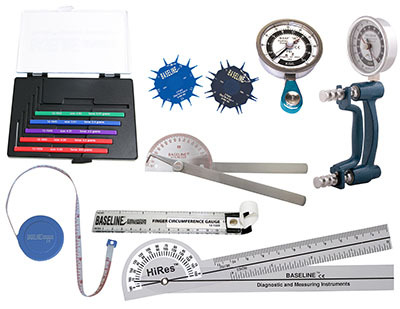 Baseline® 3-piece standard hand evaluation set includes the following instruments stored in a protective carrying case: standard 200 pound capacity hydraulic hand dynamometer (blue), standard 50 pound capacity hydraulic pinch gauge (blue), and 6 inch stainless steel finger goniometer. Dynamometer and pinch gauge have a 2 year manufacturer's warranty. CE Certified. 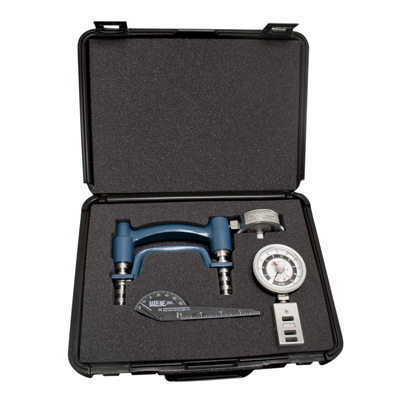 Baseline® 3-piece HD™ hand evaluation set includes the following instruments stored in a protective carrying case: HD™ 200 pound capacity hydraulic hand dynamometer (black), HD™ 50 pound capacity hydraulic pinch gauge (black), and 6 inch stainless steel finger goniometer. 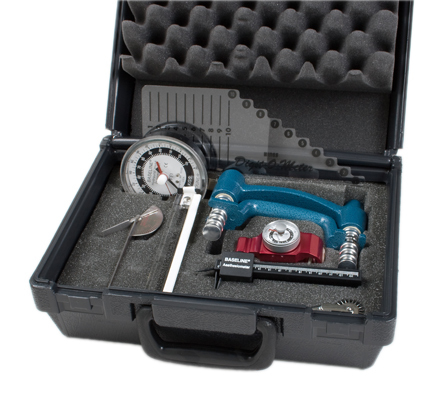 Dynamometer and pinch gauge have a 5 year manufacturer's warranty. CE Certified. 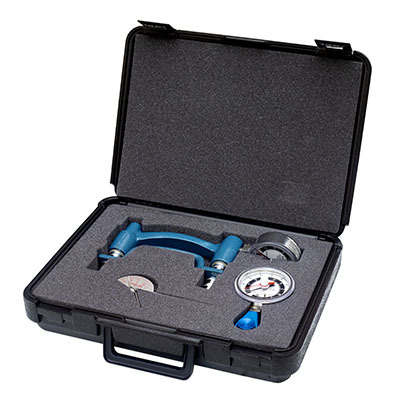 Baseline® 3-piece ER™ HiRes™ hand evaluation set includes the following instruments stored in a protective carrying case: ER™ HiRes™ 300 pound capacity hydraulic hand dynamometer (blue), ER™ HiRes™ 100 pound capacity hydraulic pinch gauge (blue), and 6 inch stainless steel finger goniometer. Dynamometer and pinch gauge have a 2 year manufacturer's warranty. CE Certified. 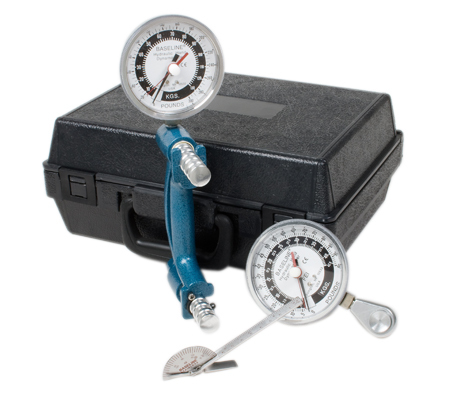 Baseline® 3-piece ER™ LCD hand evaluation set includes the following instruments stored in a protective carrying case: ER™ LCD 300 pound capacity hydraulic hand dynamometer (blue), ER™ LCD 100 pound capacity hydraulic pinch gauge (blue), and 6 inch stainless steel finger goniometer. Dynamometer and pinch gauge have a 2 year manufacturer's warranty. CE Certified. 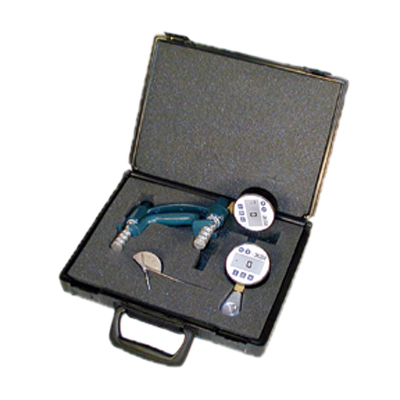 Baseline® 3-piece standard hand evaluation set with 5-position pinch gauge includes the following instruments stored in a protective carrying case: standard 200 pound capacity hydraulic hand dynamometer (blue), 5-position clinic mode 50 pound capacity hydraulic pinch gauge, and 6 inch stainless steel finger goniometer. 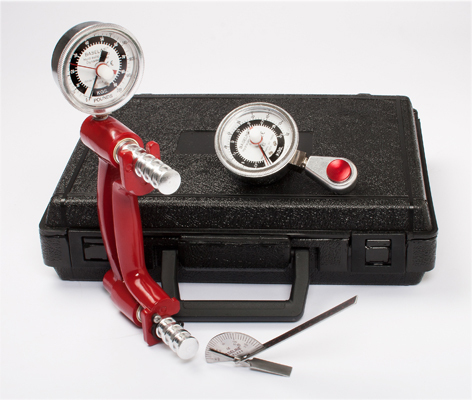 Dynamometer and pinch gauge have a 2 year manufacturer's warranty. CE Certified. More about the 5-position clinic mode pinch gauge: The adjustable handle fits all size hands for accurate and repeatable pinch measurements. 5-position strength test protocols (MVE and MMVE) now can be used for pinch measurements. Easy to adjust paddle accommodates to any size hand (other pinch gauges only have one pinch width). Pinch width without paddle is the same width as standard pinch gauges, both mechanical and hydraulic. 5 pinch positions permits MVE and MMVE protocols to be used with tip, palmar and key tests. 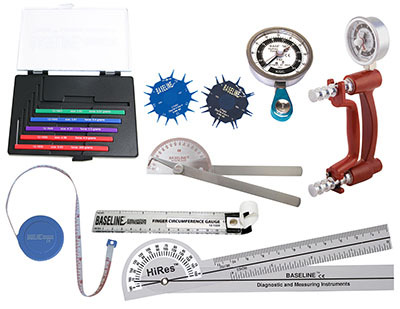 Baseline® 7-piece LiTE® hand evaluation set includes the following instruments stored in a protective carrying case: LiTE® 200 pound capacity hydraulic hand dynamometer (red), 30 pound capacity mechanical pinch gauge (blue), 6 inch stainless steel finger goniometer, 2-point discriminator with 3rd point, Wartenburg pinwheel, finger circumference gauge and functional finger motion gauge. Dynamometer and pinch gauge have a 1 year manufacturer's warranty. CE Certified. Baseline® 7-piece standard hand evaluation set includes the following instruments stored in a protective carrying case: standard 200 pound capacity hydraulic hand dynamometer (blue), 30 pound capacity mechanical pinch gauge (blue), 6 inch stainless steel finger goniometer, 2-point discriminator with 3rd point, Wartenburg pinwheel, finger circumference gauge and functional finger motion gauge. 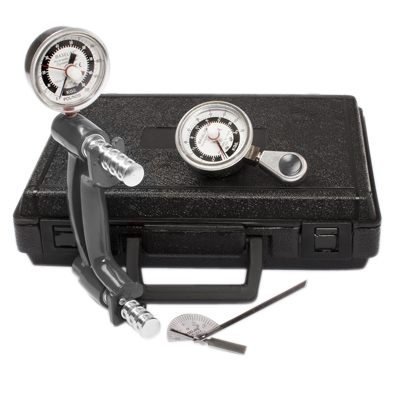 Dynamometer and pinch gauge have a 2 year manufacturer's warranty. CE Certified. Baseline® 7-piece HD™ hand evaluation set includes the following instruments stored in a protective carrying case: standard 200 pound capacity hydraulic hand dynamometer (black), 30 pound capacity mechanical pinch gauge (blue), 6 inch stainless steel finger goniometer, 2-point discriminator with 3rd point, Wartenburg pinwheel, finger circumference gauge and functional finger motion gauge. Dynamometer and pinch gauge have a 5 year manufacturer's warranty. CE Certified. Baseline® 7-piece HiRes™ ER™ hand evaluation set includes the following instruments stored in a protective carrying case: HiRes™ ER™ 300 pound capacity hydraulic hand dynamometer (blue), 60 pound capacity mechanical pinch gauge (blue), 6 inch stainless steel finger goniometer, 2-point discriminator with 3rd point, Wartenburg pinwheel, finger circumference gauge and functional finger motion gauge. Dynamometer and pinch gauge have a 2 year manufacturer's warranty. CE Certified. Baseline® 8-piece LiTE® hand evaluation set includes the following instruments stored in a protective carrying case: LiTE® 200 pound capacity hydraulic hand dynamometer (red), LiTE® 50 pound capacity hydraulic pinch gauge (red), 6 inch stainless steel finger goniometer, finger circumference gauge, 180 degree 6 inch plastic goniometer, measuring tape, Discim-A-Gon™ and tactile™ 5-piece monofilament set. 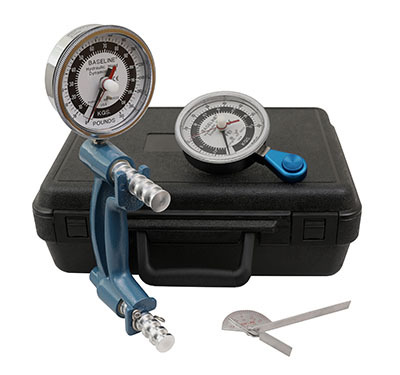 Dynamometer and pinch gauge have a 1 year manufacturer's warranty. CE Certified. Baseline® 8-piece standard hand evaluation set includes the following instruments stored in a protective carrying case: standard 200 pound capacity hydraulic hand dynamometer (blue), standard 50 pound capacity hydraulic pinch gauge (blue), 6 inch stainless steel finger goniometer, finger circumference gauge, 180 degree 6 inch plastic goniometer, measuring tape, Discim-A-Gon™ and tactile™ 5-piece monofilament set. 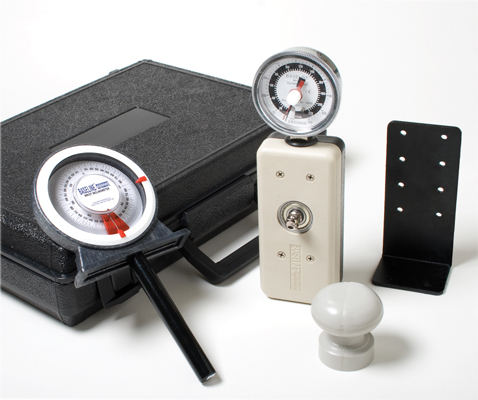 Dynamometer and pinch gauge have a 2 year manufacturer's warranty. CE Certified. Baseline® 8-piece HD™ hand evaluation set includes the following instruments stored in a protective carrying case: HD™ 200 pound capacity hydraulic hand dynamometer (black), HD™ 50 pound capacity hydraulic pinch gauge (black), 6 inch stainless steel finger goniometer, finger circumference gauge, 180 degree 6 inch plastic goniometer, measuring tape, Discim-A-Gon™ and tactile™ 5-piece monofilament set. 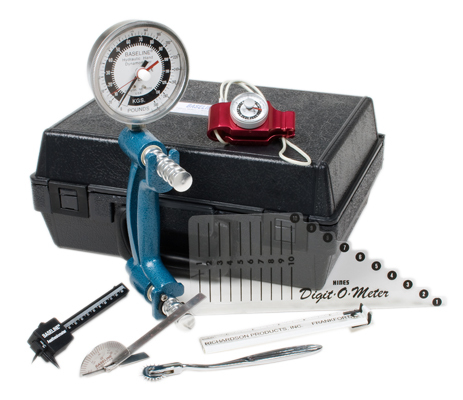 Dynamometer and pinch gauge have a 5 year manufacturer's warranty. CE Certified. 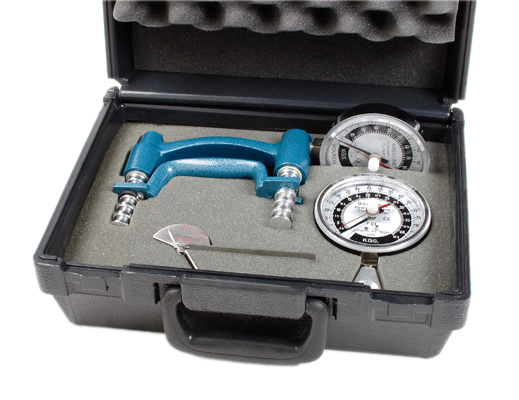 Baseline® 4-piece analog wrist evaluation set includes the following instruments stored in a protective carrying case: analog 500 pound capacity hydraulic wrist dynamometer, door knob grip, mounting bracket and wrist inclinometer. Dynamometer has a 1 year manufacturer's warranty. CE Certified.